Episode 31 of Linux in the Shell discuses the use of the who command. The who command does more than just identify who is logged into a system. Who is coupled with init and will produce statistical information about the system since the last boot. Make sure you visit the entry on http://www.linuxintheshell.com/2013/06/04/episode-031-who/ to get the full write up of the who command and for further information in the bibliography on topics discussed. Episode 30 of Linux in the Shell talks about the use of the vmstat command. Learn about Linux Virtual Memory managment and the files in /proc where vmstat gathers information. This episode of LITS talks about using Apache Benchmark utility to test websites. Learn how to use and interpret the results of Apache Benchmark. Episode 28 of Linux in the Shell talks about extended attributes and how to view them with lsattr and change them with chattr. Attributes are discussed in some detail and those that are mutable by chattr are noted. seq - sequence will list all the numbers given a stopping point or a starting and stopping point. You can also specify an increment or decrement value. arithmetic - Arithmetic is a game from the bsd games package that will quiz you on arithmetic problems. Last episode of Linux in the Shell discussed the use of the bc command to perform math on the command line. This episode continues in suit with a mathematical theme picking up from the last examples of converting between different number systems or units. While bc can help you convert between units if you know the formulas, there is another program which will do it all for your units. Chances are units is not installed by default but a simple check in your package manager should allow you to add units to your daily tool set. Math from the Linux command line is one of those tasks that is not as straight forward as you may think. There are many tools that will allow you to perform mathematical functions accessible to you, but to perform simple arithmetic is not as simple as just entering some equation. You can use the echo command to perform basic mathematical problems but it does not allow for decimals making division in particular problematic. This final installment on the top command will discuss the alternate displays for top. When starting top with the defaults one is presented with a full screen view of top containing the summary window at the top and the task area in the bottom. The task area usually takes up three quarters of the top window. This display is not the only informative view that top has. By pressing the “A” key the “Alternate Display” view is presented where the task area becomes four separate task areas of equal size called “field groups”. The summary area remains where it is. Each of the four field groups displays the task information in a different manner. Others would have given up by now. Not our Dann ! He continues his epic coverage of the Top command and in this episode will detail how to control the output of top via shortcut keys and command line switches. Dann continues his systematic analysis of the top command and you absolutely need to check out the text, and video for this one. This will display the contents of some_file from line 30 to the end of the file. The du command provides a summary of disk usage for files and directories. The default behavior is to show the number of blocks used by the contents of a directory or directories the command is run on. Usage is calculated recursively for directories. When du encounters a directory it will recurse into subdirectories and show the disk utilization of the files and directories under that directory and then present a total for the topmost directory. This cascades down through each subdirectory where the subdirectory becomes the parent and each child directory is summarized and the parent then totalled. Today's show is brought to you by the letter "w" and the number "9"
In today's show Dann explains to us what it means to be free. 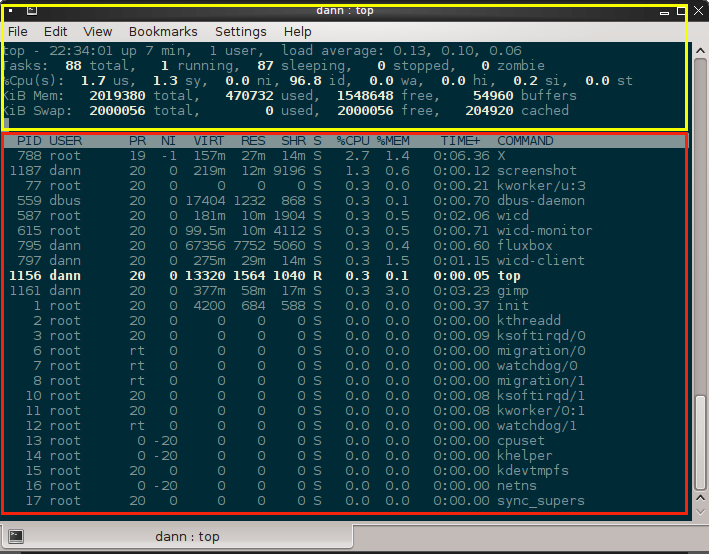 The free command is a handy snapshot into your systems memory and how much of it is being used. In conjunction with other tools like top you can begin to understand where your system resources are being utilized and weed out potential bottlenecks and bugs. But before jumping into the deep end in system analysis, you need to have a decent grasp on how the Linux kernel utilizes memory, or your initial observations may send you tearing through the interwebs looking for a solution to a problem that does not exist. Pay attention everyone, this is serious stuff. This is CHMOD a powerful and dangerous operator that has infiltrated to the heart of every unix and linux system. We have been receiving reports that it has also behind many strange incidents leading to computer compromise and in some cases complete lock down. Our American colleague, Special Agent Washko, will show us how to, in his own words "turn this bad boy around" so we can get it working for us. As ever the extremely detailed shownotes can be found on his site http://www.linuxintheshell.com/2012/05/22/episode-007-chmod-and-unix-permissions/. In our continuing journey around the command line, Dann takes us to visit the outer edges and talks about the pmount command. Don't forget that he also has a video component, and as ever this one is worth a watch. Each line in test1.txt has been “pasted” to the corresponding line in test2.txt. http://www.linuxintheshell.com/2012/04/10/episode-004-paste/ for the complete shownotes, including video. http://www.linuxintheshell.com/2012/03/28/episode-003-cut/ for the complete shownotes, including video. In the third in the series, Dann introduces us to the tr command. In the second in the series, Dann concentrates on producing a image from the command line, QR codes to be precise. He says: "The qrencode application is a tool to rapidly produce qrcodes. Qrcodes are handy little images that embed information many cell-phone cameras can read to do a number of tasks like provide a link to install applications, provide links to web sites or videos, or to add contacts into the address book. With qrencode, in seconds you can generate these images. Welcome to the first entry of Linux in the Shell. Before delving into specific commands, redirection will be explored as redirection will be used frequently in the examples going forward. The Unix philosophy posits program simplicity and that a program should do one thing and do it well (Mike Gancarz, the Unix Philosophy). Eric Raymond adds the Rule of Composition: "Design programs to be connected to other programs." Redirection is the glue that achieves this design.